The world's best-selling guitar multi-sample library has evolved into a brand new volume of expressive instruments created for Hans Zimmer by veteran sound designer Bob Daspit. Many of the new instruments feature velocity switching up and down slides, in addition to a new method for controlling vibrato with dynamics. With the authenticity and character of each instrument beautifully captured, these guitar patches are a real pleasure to play and more realistic than ever. Among the distinctive sounds in this collection: Great new Pop sounds including a rich, moody Jazz Guitar whose elegant sound stands alone even for solo compositions - a spirited 1909 Gibson A2 Mandolin, perfect for country & folk tunes - a 1947 Lap Steel Slide guitar for that Ry Cooder vibe - the Coral Electric Sitar, originating in the psychedelic sixties, and revived by Pat Metheny - the deep twang of the Electric Baritone - and Finally, a brand new Steel String Acoustic guitar that will easily become the most indispensable sound in your collection. Its clarity, tone and balance are ideal for both fingerstyle compositions and soloing, but this guitar will most likely find its way onto all of your tracks. A new classic. Among the most exotic instruments from South America are the Cuatro, a hollowed-out single piece of wood with 4 sets of strings that create shimmering tones with great sustain - the Charango, a unique instrument made from the body of an armadillo with round, sparkling tones - the Cavaquiñho, a high pitched guitar whose characteristic tones possess great depth - and a bold Flamenco Nylon guitar whose tones, tremolo and rasgando will ignite passionate compositions. Perhaps most rare in this collection are the string sounds of the Middle East (created for The Prince of Egypt score), including the Oud, a fretless 11-string guitar with full-bodied round tones - the Saz, a spicy six-string instrument perfect for traditional middle eastern arrangements - the Cumbus, like a 12-string with an Arabic accent - and the unusual Yayli Tambur, a long necked instrument capable of haunting drones and plucky melodies. Through precise, quiet recordings and innovative keyboard layouts, producer Bob Daspit has managed to capture all of the beauty, resonance, simplicity and character of these fine instruments. The recordings on this new volume bring sampling into a whole new artistic level for composers and songwriters of the next millennia. 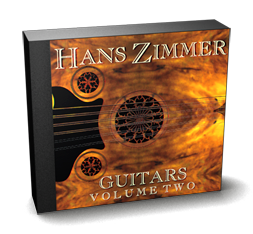 A tour through a few of the remarkable acoustic guitars, mandolins, jazz guitars, ethnic guitars and flamenco guitars from Hans Zimmer Guitars that are included in Omnisphere in enhanced form. A relaxing and simple tune that shows how well these instruments can be used in more traditional song settings. "...great care was taken in choosing the best-sounding instruments of each type. Certainly the results bear this out, as the quality and consistency of the sampling is excellent. Most samples feature velocity switching in up to four layers, and everything is designed to be played...these sounds are as good as they come, and even the steel guitar is quite convincing if you play the right phrases and use your bend wheel carefully...the electric sitar is surprisingly delicate and musical...the excellent quality makes this a must-have disc for anyone needing first-class plucked instrument sounds. Because of this, and the fact that guitars are so difficult to multisample convincingly, this collection deserves all five stars."